Sprinklermatic is one of the largest fire safety solutions provider in Florida. We are specialists in backflow preventer installation, testing and maintenance services. We service, install and inspect all sizes of fire backflow devices throughout Florida. We test and certify the installations. Sprinklermatic is ready to service your fire backflow assembly. Testing and repair of fire sprinkler Backflow Preventers. Regular scheduled inspections and maintenance. NFPA fire Backflow Inspection reports. Testing for building contractors for building permit certificate for occupancy. Learn more about fire sprinkler systems in general. Read about Sprinklermatic fire sprinkler system design services. Backflow Preventer Installation: protect potable water supplies from cross contamination. Most municipal codes require backflow prevention devices to protect the local water supply. Backflow prevention is typically implemented at each cross-connection point within a plumbing system. We do this to prevent contaminated water from coming into contact with potable water. hazardous materials like chemicals and fertilizers. 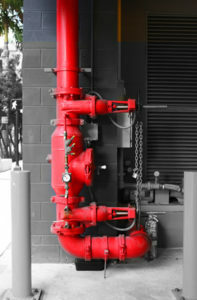 Sprinklermatic is uniquely suited to ensure a correct backflow preventer installation. Backflow problems are typically created by forces that are beyond our control. A backflow prevention device is a key safety and health component of your business. Contact us or schedule your backflow test today and rely on Sprinklermatic to help keep your property and water safe. The Sprinklermatic inspection and maintenance team specializes in fire sprinkler systems for commercial buildings such as warehouses, offices and hotels, as well as residential properties like single-family homes, condos, apartment buildings and townhouses. At Sprinklermatic, our certified inspectors will test and certify commercial and residential backflow prevention devices. We will then make sure that the relevant municipality receives all the required documents demonstrating compliance with regulations. Cross-connection controls on all testable backflow devices. All backflow assemblies and RPZs. At Sprinklermatic University we provide a program of Continuing Education and Live training of Backflow Preventer Installation and Maintenance.